MoonJune Records has posted sound clips for the new Holdsworth Pasqua Haslip Wackerman release Blues for Tony. The double CD set is now available for pre-order as well. Official release date in the USA, January 2010. Europe + Japan, release on October 25, 2009. The cd will be available exclusively via MoonJune Records' website from September 15, 2009. Recorded live during the European tour in 2007. Produced by Holdswoth, Pasqua, Haslip, Wackerman. Executive production by Leonardo Pavkovic. Exciting news folks! Moonjune Records has announced an upcoming release from "HOLDSWORTH PASQUA HASLIP WACKERMAN" entitled Blues for Tony. As fans of this site may know, Allan Holdsworth, Alan Pasqua, Jimmy Haslip, and Chad Wackerman have done some tours in recent years in tribute to legendary drummer Tony Williams (whom Holdsworth and Pasqua both played with). So far the only official release to come out of these shows has been the Live at Yoshi's DVD. This new double CD is likely a live recording as well, but I can't confirm that yet. I'll post more details as they become available. UPDATE: I've confirmed this will in fact be a live album, sourced from various shows. They are also planning a tour of the east coast for late January/early February. In the mid-1970s, guitarist Allan Holdsworth and keyboardist Alan Pasqua played together in the late drummer Tony Williams' New Lifetime band. This was a classic fusion band that turned a lot of people on to Allan Holdsworth for the first time. Holdsworth and Pasqua have collaborated several times since those days, but in 2006 they joined forces with Chad Wackerman on drums, and Jimmy Haslip on bass for a special tour to pay tribute to the music of Tony Williams. The September 29th show at Yoshi's in Oakland CA was filmed by Altitude Digital for this DVD, and the result is the best Holdsworth footage I have ever seen. First off, this is a beautiful looking video. It's a standard DVD, but it was filmed in HD, and looks fantastic on an LCD HDTV. The footage is crystal clear, and the audio is great (for those of you wondering, there is a 5.1 surround sound option). The editing is a bit quick in some spots, but it wasn't a distraction for me. Overall, this feels like a "band" show; not just an Allan Holdsworth show. That's not due to the song selections either, it's just an overall vibe I got from watching these players. In fact, if anyone is the leader here it's Pasqua, not Holdsworth. That said, this disc is a must-have for Holdsworth fans. His playing is a little tentative early in the show, but he seems to settle in after a couple of tunes. He takes some amazing solos, and his tone is to-die-for. I really like Pasqua's playing as well. He uses a variety of old-school fusion tones, and really locks into the groove on his solos. Wackerman and Haslip make for a very tight rhythm section too (Wackerman plays a pretty small kit in this show, which I thought was cool). The whole gig has a real "throwback" feel to it. One gets the impression Holdsworth and Pasqua wanted to turn back the clock, and jam like they did in the 70s. It's an excellent show from beginning to end, but several songs really stood out for me. "It Must Be Jazz" is a great tune that has 2 parts. It begins as an up tempo, swing jam, but later morphs into a slow ballad. Holdsworth takes a great solo in each part of the tune. "Blues For Tony" is another highlight. This funky blues, written by Pasqua, has Holdsworth's best solo on the disc. It's always fun to hear Holdsworth navigate more traditional chord changes with his unique harmonic sensibilities, and this solo is a perfect example of that. Wackerman takes a nice drum solo on this one as well. "San Michele" is a beautiful piece (also penned by Pasqua) that sounds very Mahavishnu-esque. Holdsworth's tone and touch are a perfect fit for the slow, soaring melody here. His solo on this one is great as well. The final tune on the disc is a re-worked version of "Red Alert". I love what they do with this fusion classic. Forgoing the main riff at the beginning, the band starts off with a new funky shuffle groove that has no resemblance to the original tune; pretty sneaky. It isn't until the first half-step key change in Holdsworth's solo that it starts to sound like Red Alert. After Pasqua plays a great funk-inspired solo with a grinding 70's tone, they finally launch into the classic Red Alert riff at the very end. The crowd eats it up. Of the 3 songs on the disc from the old Tony Williams band (Fred, Proto Cosmos, and Red Alert), this one was my favorite. All Holdsworth fans need this DVD in their collection. His playing has never been documented so well as on this disc. Fusion and jazz fans will dig this show also. This is a tight, grooving band with some incredible players. Kudos to Altitude Digital for putting together this fine disc. Highly recommended. 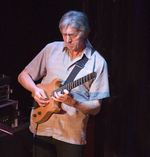 All About Jazz has posted a review of the new Allan Holdsworth/Alan Pasqua Live At Yoshi's DVD. I should be receiving my copy of this disc by early next week. I can't wait! The Allan Holdsworth & Alan Pasqua Live at Yoshi's DVD is now available for pre-order directly from the Altitude Digital website. This short clip is one of several from the DVD that Altitude Digital has uploaded to YouTube. 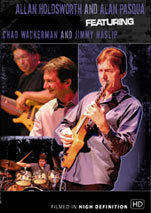 The DVD was recorded live at Yoshi's in Oakland California last year, during a tour Holdsworth and Pasqua did with Chad Wackerman (drums), and Jimmy Haslip (bass). On the tour, the band played material from the old Tony Williams New Lifetime band, which Holdsworth and Pasqua were both members of. The show was filmed in HD, but it's not clear from the pre-order page if this is a standard DVD, or an HD-DVD. I'm assuming it's standard. There's no release date listed either, but all indications are it should be released soon. 2/2/07 Update: The release date should be March 6th or 13th, and it's confirmed to be a standard DVD. Check out this thread on the Holdsworth forum for more info. 5/7/07 Update: Read my review of this DVD here. Per Allan Holdsworth's website, the live DVD recorded recently at Yoshi's in Oakland, CA will be released in eary 2007 by Altitude Digital. That same lineup (Holdsworth, Pasqua, Wackerman, Haslip) will play some more live dates in Europe in early May 2007. Also, Holdsworth's trio (with Chad Wackerman - drums, and Jimmy Johnson - bass) will be touring the northeastern US in March 2007. Dates and venues TBA. Jon Hammond has done an interview with keyboardist Alan Pasqua. Alan is currently touring with Allan Holdsworth, Chad Wackerman, and Jimmy Halsip. He discusses the recent live DVD shoot they did, even saying the DVD with Holdsworth and the gang could be out by Christmas (!). He also talks about his time in Tony Williams' New Lifetime band. The link below will take you to the video of the interview. 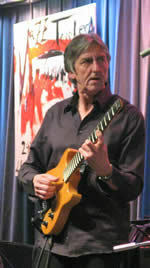 There are some west coast gigs coming up for the Allan Holdsworth/Alan Pasqua Group. According to Alan Pasqua's site, the show's at Yoshi's in Oakland from Sept 28-Oct 1 will also be used for a "Live DVD Shoot". UPDATE: This DVD has been released. Read my review here.